The film has been reported as being “about selfies”. Vanity Fair even suggests it is “anti-selfie”. And indeed it features selfies, but again they are used as a technique for expressing something else; something – surprise surprise – negative about young women. Dunst asks the girls “do you want to talk about anything?” The response is just blank stares and a request for Dunst to tag them, which she mutely refuses to do. An encounter of any kind that is based to this degree on one party’s gratification rather than mutual interaction is of course problematic. But why is the selfie being used to express this? I would argue that it’s because the selfie is culturally understood to be something, and to be somebody – to be the quintessential example of a problem that has long preceded it. After all, autograph hunters presumably have always been a problem for celebrities, with the added dimension that the desired signature could also have a cash value. The predatory, even hostile, stares they give Dunst are therefore not typical of selfies, but of the relationship between celebrities and the public more generally. 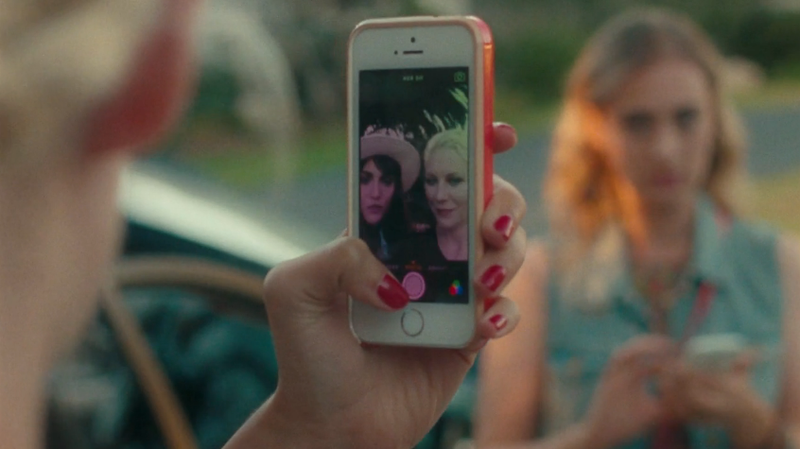 At one point Dunst asks whether one girl taking a selfie wants her friend to take the photo for her – the young woman replies “I don’t trust her”. The selfie is therefore not just representative of selfishness and poor social skills, it also implies inter-personal relationships that are lacking. Presumably they’re not very close because … they take selfies? The girls drive off, enjoying the likes and “random followers” which this encounters has already brought them, blithely unaware of just how awkward and exploitative this social interaction was. And we as viewers are again instructed in what not to be, and how that is specifically expressed through an attitude that maligns and rejects selfies and those who take them.